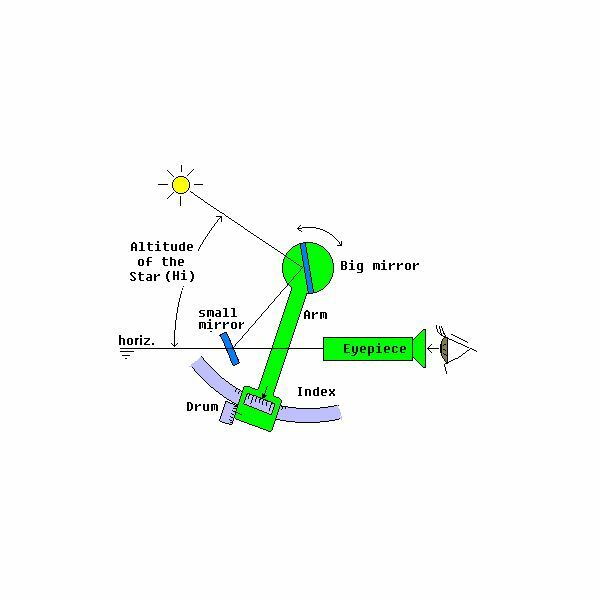 The direction in which any point on the earth’s surface is carried (because of the earth’s anticlockwise rotation) is called East. 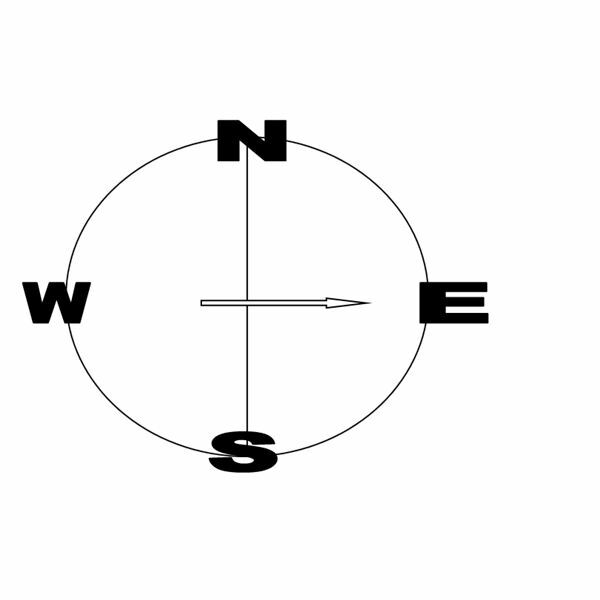 The opposite direction is West. ABEAM – At right angles to the navigating bridge of a ship. 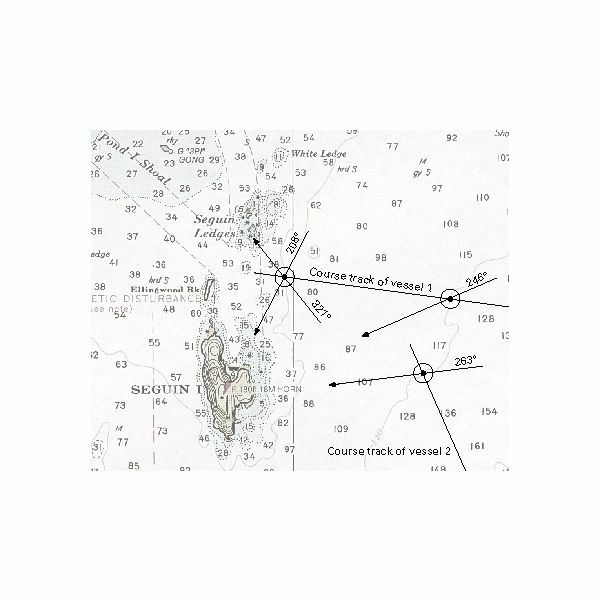 ABAFT – Between abeam and astern. 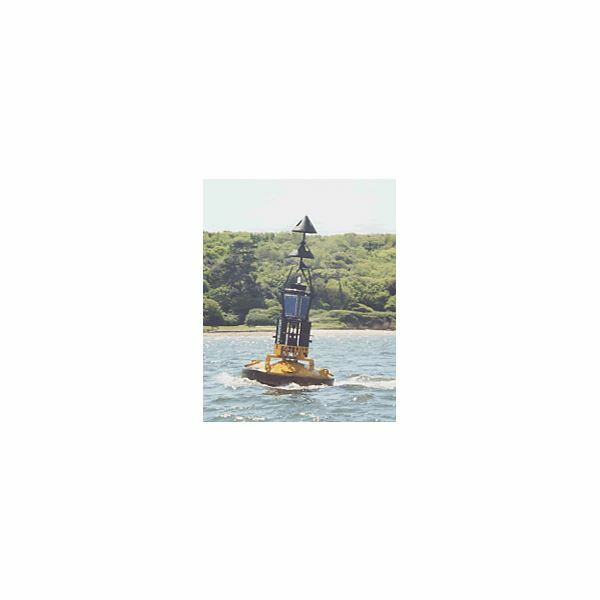 ASTERN – In back (stern) of the ship, opposite of ahead. PORT: The left of the ship, facing the bow OR, a harbour. STARBOARD: The right side of the ship, facing the bow. AGROUND – Touching or stuck to the bottom of the seabed. ANCHORAGE A place suitable for anchoring in relation to the wind, seas and the sea bottom. BEARING – The direction of an object relative to the heading of the ship. Measured in degrees. DRAFT – The depth of water a ship draws. 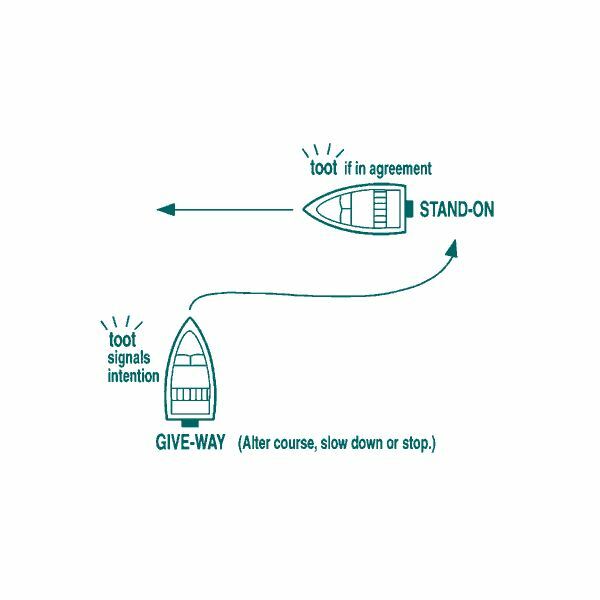 GIVE-WAY VESSEL A term used to describe the vessel which must yield in meeting, crossing, or overtaking situations. STAND ON VESSEL A term used to describe the vessel which may NOT yield in meeting, crossing, or overtaking situations. 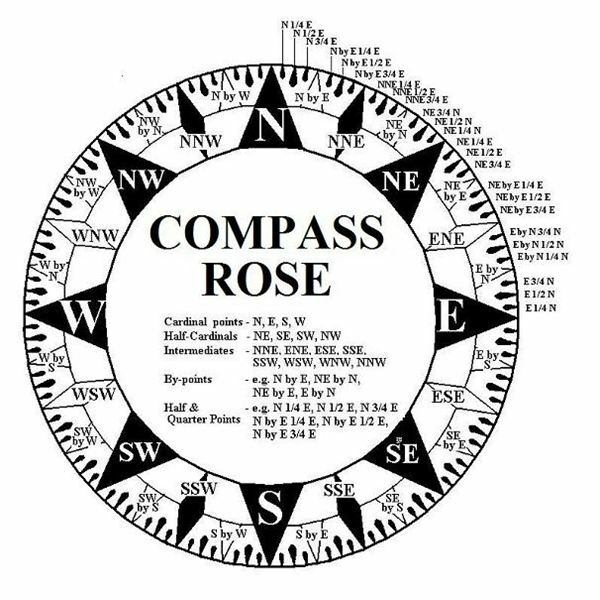 A COMPASS ROSE (see pic) is a easy means- for a navigator- of finding direction on the chart and also plotting a ship’s course, besides taking bearings (angles) of objects with a compass. Called because it looks like a rose petal opened up, it is graded from 0 degrees to 360 degrees, with 0 being North, 90 being E, 180 being S and 270 being W.
SOUNDING A measurement of the depth of water. HEADING (HDG): The direction in which the ship is pointing in any instant. SET: The direction in which the current is flowing. DRIFT: The speed (in knots) of the current. 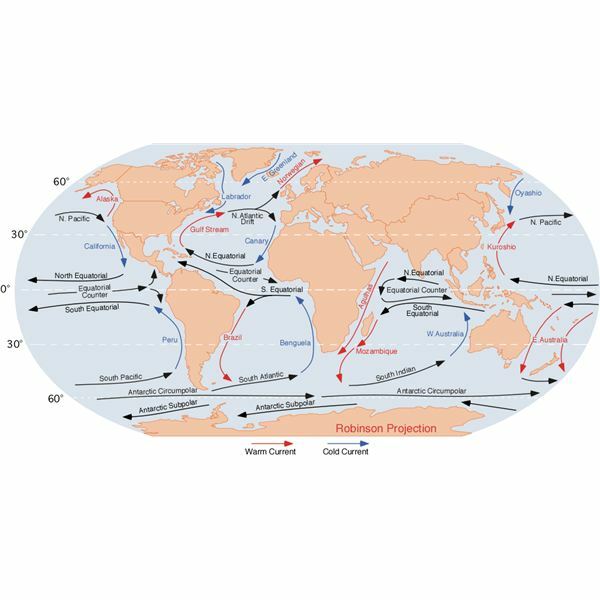 COURSE: The direction in which a vessel is steered or is intended to be steered (direction through the water). 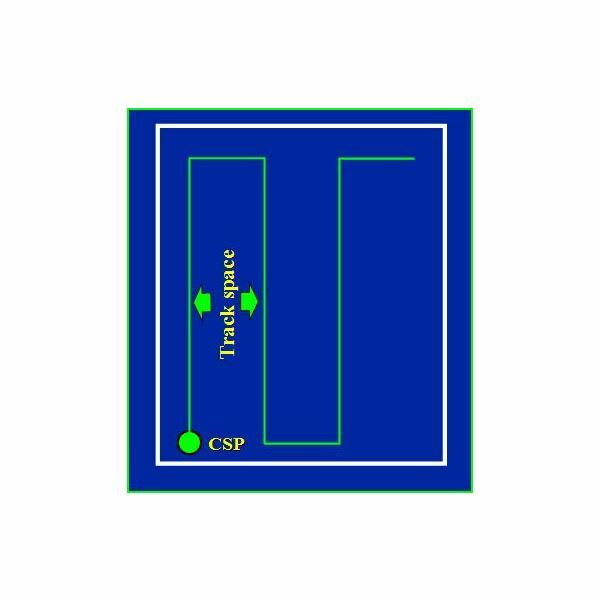 COURSE is the intended horizontal direction of travel measured from 000 degrees clockwise through 360 degrees, where 000 is North. 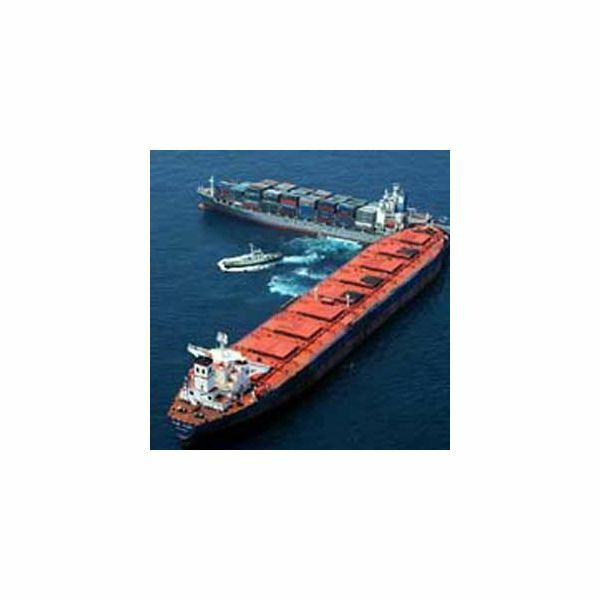 The Purpose of the COLREGS (Collision Regulations at sea) is to cover, by international convention, anti collision rules any ships belonging to any nationality will follow at sea. Also called ROR or Rules of the Road.